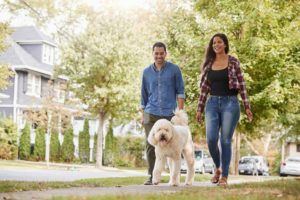 Whether you’re walking for exercise, or to simply welcome spring, it may seem like taking a stroll around the block is a great option. The truth is that walking is good for the health of most people – but pedestrian accidents are on the rise. Does this mean you should never take a walk? No – but it does mean you should be aware of the dangers. Keep reading to find out more the danger inherent in walking. If you have been injured in a pedestrian accident, or a loved one lost their life in a pedestrian accident, we welcome your call to Law Offices of Patrick S. Aguirre for a free legal consultation. The bad news is that you are in more danger as a pedestrian than anyone else on the road – you are in more danger than if you were riding a motorcycle, a bike, or in a car. One issue is that drivers simply do not pay attention to what is happening on the sidewalk or as they near crosswalks. Drivers acting negligently is more than dangerous, and it is more than aggravating – it is deadly. When you consider the statistics on pedestrian accidents, the picture is scary. Every two hours, a pedestrian dies due to injuries related to a pedestrian accident. Across the country, an average of 430 people are treated every day for injuries sustained in pedestrian accidents. Consider that in just one yare, more than 156,000 people ended up in the emergency room, with more than 4,700 deaths, just from pedestrian accidents. Anyone can be the victim of a pedestrian accident but there are certain people who have a higher risk than others. The statistics show that men are more likely to be hit and injured or killed than women. A person who has been drinking is more likely to be in a pedestrian accident. In fact, about 33% of pedestrian accidents involve alcohol. The most likely age group to go to the ER for treatment after a pedestrian accident is 15 – 29. However, the older a pedestrian is, the more likely they are to die from their injuries. Remember that pedestrians have no protection form the elements and no protection if they are hit by a vehicle. If you have been the victim of a pedestrian accident, or you have lost a loved one due to this type of accident, you may have grounds to sue for compensation for your damages. Contact Law Offices of Patrick S. Aguirre at 800-572-1252 now to request a free consultation with a personal injury attorney.